If there’s one common challenge that all sellers start with from the day we first consult with them in advance of their marketing, it’s this: poor organization. And, of course, parents with kids at home often have the steepest hill to climb. It’s not enough to GET organized for showings, they’ve got to somehow KEEP organized. Here are some ideas we’ve shared with sellers to whip kids’ “stuff” into shape, get their homes sold and impose some much needed order on their homes into the future. Transformer cribs. An ordinary crib accommodates baby for two to three years — until he learns how to escape over the rail. Boost storage with a convertible crib with storage drawers ($145 to $350) that’ll convert and adapt to your toddler’s needs and beyond. Some convertible cribs change into toddler beds, daybeds, or full-size headboards, giving you options as your youngster gets older. If you can’t find a crib with storage below, use the space between the legs for stowing bins or baskets for diapers, toys, and more. Pimping the closet. Remove the door on the nursery closet for easy access, and install a variety of cool storage features. Drawers, bins, and shelves can round up onesies, booties, baby towels, diapers, and toiletries. A simple wire rack storage system is $90 to $350 at home improvement centers. Install lower rods so baby, as he grows, can easily latch onto duds (and maybe even hang them up). Expandable hangers ($14 for a 3-pack) fit tiny baby clothes but open up to accommodate larger sizes when needed. Look ‘em in the eye. Stow books and puzzles on a low magazine rack or shelving unit so toddlers and elementary-age children can grab a good read or brain teaser on a whim. As children grow, paint the shelf to suit changing tastes and use it for teen magazines, framed photos, and school books. Cornering the market. 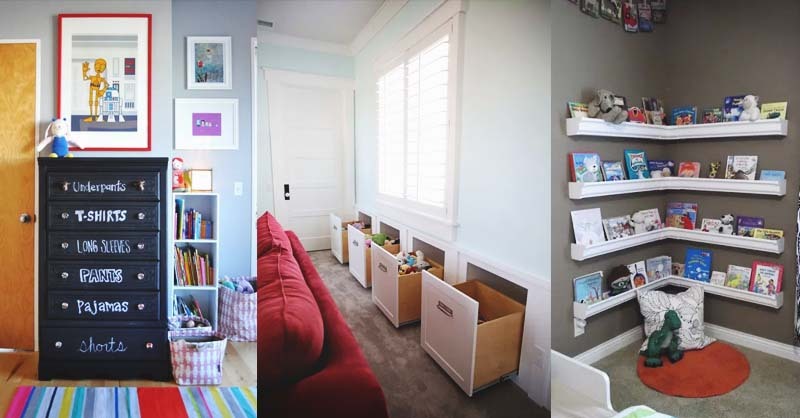 Young kids love nooks, so create a cozy hideaway by arranging storage units — open shelves, a desk top, and cabinets — so they (mostly) enclose one corner of your kid’s room. 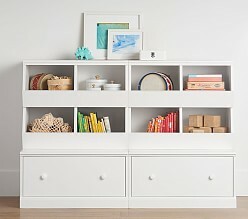 Bookshelves and kids’ desks range from $50 to $200. Stock up with plenty of games, books, toys, and crafts supplies. Paint cabinet doors with blackboard paint to add an eye-level creative opportunity. Corral the bling. Little girls often possess a cartload of hair ribbons, barrettes, and bows. Look for special organizers that keep them on display, orderly, and within easy reach. One option: Sort items into the pockets of a clear vinyl shoe holder ($10) that fits on the back of the door. A magnetic personality. A bulletin board is a great way for your tween or teen to organize and display all those photos of friends and Fido. Or, coat a vertical surface (such as a closet door) with magnetizing primer ($25/quart) and paint over the primer with a hip color. 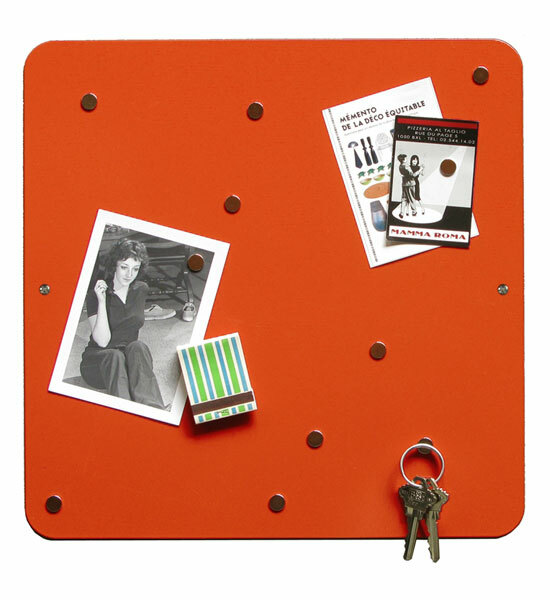 Use assorted magnets and magnetic clips and holders to display artwork, sports schedules, and homework reminders. Making a (book)case. A bookcase headboard ($100 to $200) is a grown-up way for your teen or college student to keep reading materials organized and the tablet reader handy. Platform storage beneath the bed provides room for drawers or cubbies that can hold baskets and bins for corralling small stuff. Explore the shallows. Commandeer space between wall studs and create a shallow storage niche outfitted with hooks, shelves, or rods for organizing jewelry and other smallish gear. Add a mirrored door to keep clutter out of sight. Lofty ambitions. For a small bedroom, a loft-style bed offers a fun spot for snoozing and space below for bookcase storage, a futon, or a study desk. Loft beds for kids’ rooms start at $150 and range to $3,000 or more. Keep rolling. Give your tween or teen a rolling caddy ($25 to $80) for storing personal bath supplies, jewelry, cosmetics, and hair gear. The caddy stores in the bedroom and rolls to a nearby bath and back.